Recent updates focused on bringing bigger changes and even new content in form of a new game mode to the game. We also overhauled player lobbies and the in-game shop. Today, we want to focus on Quality of Life features such as deck naming, more deck slots, an emote selector, reworked skyboxes, and lighting while we prepare for the Discord launch. We also want to let you know that the server downtime will be a bit longer than usual, as we have to run, update & upgrade quite a few things to prepare for a stress test on Sunday, September 30th starting at 16:00 UTC, as well as the Discord launch later on. Unfortunately, we do not have any estimated downtime at this moment. For more information about the stress test, please see our latest blog post. Deck naming is here! You can now give your decks a name of up to 16 characters, and get organized. Try new tactics, have a deck for each day, you do you! It is now more convenient than ever to take advantage of all the deck slots you have. Note: Only you can see your deck name. New Emote Selection tool! Select up to 8 emotes to have on hand at any time in a game. This should help with the issue of our towering emote box. To select your emotes, go to the Master select screen under the “emotes” tab to edit your new emote wheel. We’ve also enabled a Hotkey for this new system you can use in-game - Just press Y and try it out! Improved skyboxes and lighting! We’ve touched up the existing effects you see in-game to make them that much nicer. We’ve added deck slots to the shop rotation. You can buy 6 slots (one page) for 1.200 Rubies, but you can expect juicy discounts! While you can only buy a single offer once, you can buy deck slot offers repeatedly as they occur. There is no limitation to how many deck slots you can have. The notification icon has been redone to be more visible and make more sense. Also, you will now get notifications when there’s a new Mayhem available. Fixed a bug where 2v2 queues in a lobby could not be cancelled. Fixed an error in the description text for the Guardian. Fixed an error in the Soul Steal animation and its projectile. Fixed a bug where the Daily Quest reward would not be given. Fixed a bug when managing avatar whilst queuing for 2v2 - thanks Memfisto! Fixed a bug that would keep avatars from updating on the menu while queuing until a match starts - thanks Memfisto! 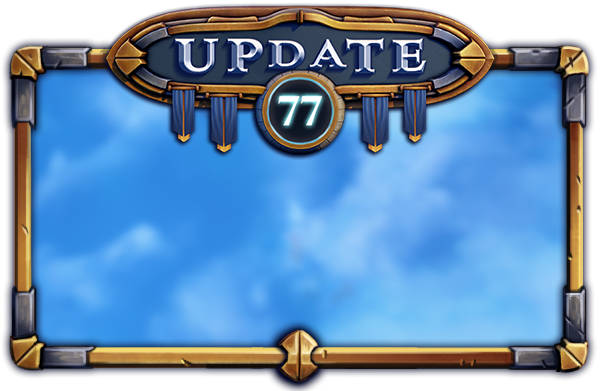 Fixed an issue where the illustration and frame for next card in the deck would not align. Fixed a bug that would keep skin selection from updating while queuing. Fixed an issue with Settsu’s take-off animation. Fixed an issue with the Avatar window resizing when it should not. Fixed an issue where the shop menu was impossible to exit - thanks Vango! Fixed Avatars in the Level Reward screen that were displayed as square when they should be round. Fixed a bug where Ravenous Swarmers could be split by the Master Tower when summoned with the cursor on the Tower - thanks Daddy Dip! Fixed a bug where Re-Boomer wouldn’t die properly from Gor’Rakk Sacrifice. Fixed a bug where stunning attacks would not reveal Assassin - thanks Truteo! Fixed a bug where the notification that a new Expedition is available would stay visible even after the expedition panel has been opened. Fixed a bug where Re-Boomer would resurrect right before it takes damage repeatedly - thanks miqdevil! Fixed a bug where the summoning animations for minions of the other team would not be displayed - thanks Daddy Dip! Fixed a bug that would display the “Incorrect Data” error after a 2v2 match. Fixed a bug where Assassin would not be revealed when attacking, and would deal critical damage on every attack - thanks Khazlariko! Fixed some issues with the newsletter rewards.